The House bill, HR7, eliminates dedicated funding for transit established in the 1980s during the Reagan Administration. The House and Senate bills both cut dedicated funding for bicycling and pedestrian projects and for the Safe Routes to Schools program. “Dedicated federal funding for transit, bicycling, and walking is imperative, so that motorists—and all Minnesotans—have options that are more affordable and reduce the growing level of congestion on already-busy roads. Transportation agencies confirm that building more and wider roads won’t solve the congestion problem. Transportation options are essential to make the most efficient use of our transportation investments. Having dedicated funds is the best way to achieve this goal” said Barb Thoman, executive director of Transit for Livable Communities. 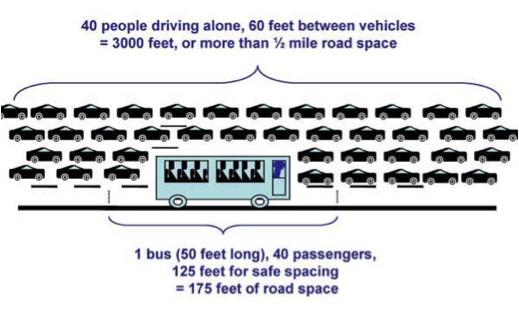 A bus carrying 40 passengers versus 40 cars on the road. Light Rail, such as the Hiawatha LRT, is even more efficient, carrying 450 passengers at capacity. Fifty percent of riders of the Hiawatha LRT say they would otherwise be driving. While the House bill has run into stiff opposition, there is pressure on Congress to enact something before the current extension of the law expires on March 31. Leaders of both parties have expressed interest in getting a transportation bill done because of the impact on infrastructure and jobs. Advocates from a variety of perspectives want to make sure that any deal-making doesn’t leave transit users, bicyclists, pedestrians, and local public works departments out in the cold. “At a time when demand for transit service is increasing, especially in communities of color where the economic downturn is felt most severely, it makes no sense that members of Congress would offer plans that cut dedicated funding,” said Russ Adams, executive director of the Alliance for Metropolitan Stability. According to the Metropolitan Council, transit ridership in the Twin Cities region is at its highest level in 30 years, with more than 90 million trips taken in 2011. Overall, Minnesota saw more than 100 million transit trips in 2010, according to MnDOT. The House bill’s elimination of dedicated funding for transit would throw Metro Transit and dozens of other Minnesota transit providers into doubt about how to plan for future service, making it impossible to know if funds will be there to replace worn-out buses or build new park and ride facilities. In addition, under the House bill, Minnesota would lose $313 million for highways over the next five years. “People all across Minnesota, from rural areas to suburban areas, rely on transit systems that need the stable, dedicated funding from the federal gas tax that has been coming back to our state for the last 30 years,” said Tony Kellen, president of the Minnesota Public Transit Association. “The House proposal would threaten transit service at a time when more Minnesotans are seeking additional transit service to get to work and live their lives. Minnesota taxpayers can’t afford this change in federal transit funding,” he added. Transportation is the second largest household expense after housing itself, and makes up an even larger share of the budget in lower-income households. The average annual cost of owning and operating a car is $8,000, according to the American Automobile Association. The House bill has raised additional reasons for objection. It cuts the bridge repair program and funding that focuses on traffic mitigation and air quality. The bill also would open protected areas, including the Alaskan National Wildlife Refuge, to drilling for oil and natural gas. In Minnesota, the House cuts to the bridge program would mean that only bridges on the national highway system would receive federal funds. The backlog of repair for Minnesota’s bridges would fall on state, county, and local funding sources. The House bill has drawn widespread opposition, including from Republican legislators. Representative Erik Paulsen, (R-MN, 3rd district) voted against the bill in committee. Another GOP representative, New York’s Peter King, said via his spokesperson that he “has serious concerns about this legislation and the impact it will have on mass transit.” Transportation for America, a national coalition advocating for a new transportation bill, has listed the top 10 objections to the House bill on their web site: www.t4america.org. Before 1990, it was illegal to spend any federal transportation funds on sidewalks or bike paths, even when highway projects tore out existing infrastructure for safe walking and bicycling. Since then, the federal program called Transportation Enhancements has dedicated about 1% of federal transportation funds to projects for pedestrians and bicyclists. Six years ago, the federal government adopted a modest program called Safe Routes to School to help improve bike and pedestrian safety and accessibility. “Across the state of Minnesota, bicycling is not only for recreation or local transportation, but is also an economic driver. Communities everywhere are redefining themselves around bicycling and walking options to ensure that they remain competitive. To cut dedicated funding is a bad economic decision,” said Dorian Grilley, executive director of the Bike Alliance of Minnesota. Nearly half of all the trips people make each day are three miles or less, and more people are bicycling or walking for these shorter trips. In the Twin Cities, bicycling increased by 52% and walking by 18% from 2007-2011. The Senate bill, sponsored by Senators Boxer (D-CA) and Inhofe (R-OK), includes health-promoting measures as well as complete streets, which would ensure that road projects consider the needs of everyone—drivers, pedestrians, cyclists, and people with disabilities. But, the Senate bill has also sparked amendments to restore dedicated funding for bicycling and pedestrian projects. Senator Amy Klobuchar has put forward an amendment to restore funding for bike trails. A broader amendment from Senators Cochran and Cardin would restore bike/pedestrian funding more broadly, covering all kinds of enhancements and the Safe Routes to Schools program.